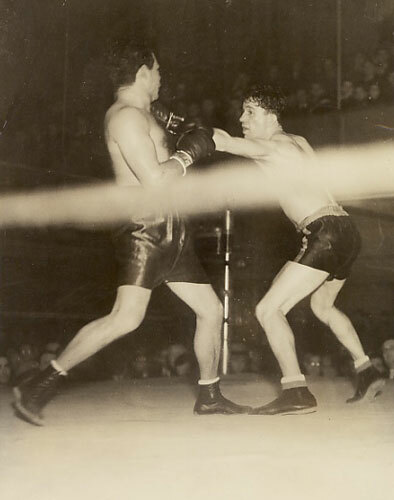 On this day in 1936, Tony Canzoneri won a ten round decision over Philadelphia's Johnny Jadick. It was their third meeting in the ring. This time however, no title was on the line and both fighters were toward the end of their careers. But the win for Canzoneri was a decisive, unanimous decision, and served as a bit of revenge for the battler from Slidell, Louisiana. The other two bouts between the pair occurred in 1932. In the first fight on January 18th, Canzoneri brought his World Jr. Welterweight belt to the Philadelphia Arena to defend it against local hero Jadick. The odds on Jadick were pretty long, and although he had to pick himself off the mat in the first, Johnny took the fight to Canzoneri and won the title with a ten round decision. Six months later on July 18, the rematch was staged outdoors outdoors at the Baker Bowl. With Canzoneri out to prove the first fight a fluke, Jadick pulled another upset and repeated his decision victory over the ten round limit to defend his title. Their third bout, celebrated today, came four years later at New York's St. Nicholas Palace. Jadick was on the decline having lost most of his recent bouts. After the loss to Canzoneri, he would fight only sixteen more times (no so many bouts in those days), winning only one in that stretch. He ended his career with a record of 104-58-10 (15 KO). Canzoneri fought on for another three years and dropped two title fights to Lou Ambers in his final campaign. His final record wound up 137-24-10 (44 KO).